No, it wasn’t a release from the Pacific Marine Mammal Center. 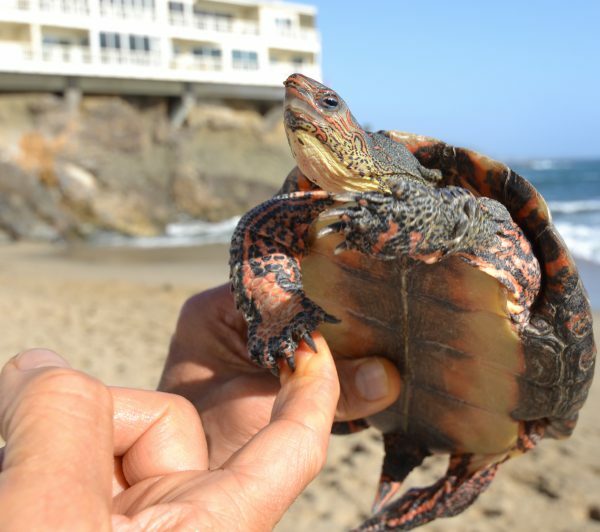 Laguna resident John Gilmour walks down to the water at Fisherman’s Cove and tosses two Honduras Wood turtles—fresh-water turtles, not much larger than your hand—out to sea. They don’t scurry off to parts unknown in the big blue. Instead, they stick their noses high above water, watch Gilmour and follow him, attentively waiting for his signal. He claps his hands and they make a beeline back to him, gliding in on their bellies like thatched-roof tiki boats with oars straight out, making a smooth landing onto his palms. That, and a rub on the top of their up-stretched heads, a handshake each and another nose kiss. Responding to the hand clap is the least of their skills. On his signal, the turtles know when to drop their shoulders and dunk under a wave, “just like a surfer,” Gilmour said. They don’t get a sardine for their talent; they get hand-rolled sushi at a local restaurant later. If they don’t get hand-carried to the restaurant by Gilmour, they ride first-class, temperature set just right, in his Tesla. Gilmour, a designer for a custom snowboard and skateboard company and expert in optimizing high-end audiophile systems, has lived with Little John and Emmett for 14 years. They came as mail-order pets, the size of quarters. 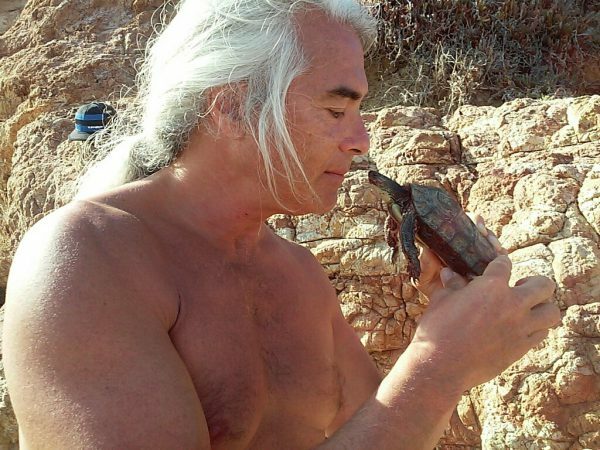 Over the years, 40,000 children have played with the turtles, he said. “Because of that, they don’t have any fear of humans of any kind.” And they’re housebroken, trained much like you train a dog. 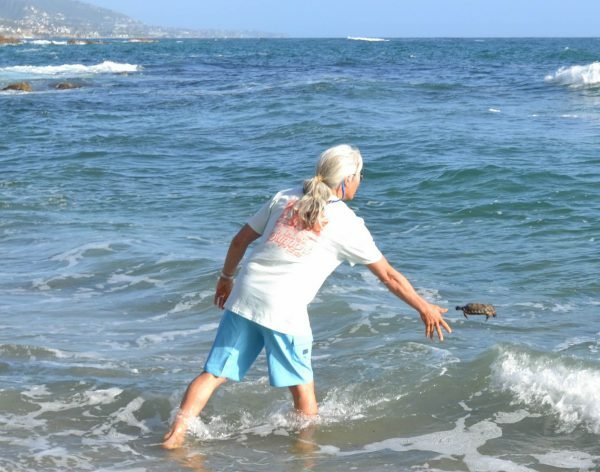 Gilmour became a turtle activist on a trip to Florida, where he scooped up green sea turtles coming out of the Atlantic to nest. The turtles would follow the glow from nearby houselights and streetlights, assuming it was the moon, right onto the asphalt and into traffic, ending their lives as road kill. Gilmour tried to get people to turn off their outside and poolside lights. “They were mostly short-term rentals, so we didn’t have enough time to educate people properly,” he said. The only thing that got their attention was when the children from the neighborhood got involved. The Honduras Wood turtle takes second-chair in the smart department only to the North American Wood turtle, said Gilmour.That turtle is listed as an endangered species and the other wood turtles are under review by the U.S. Fish and Wildlife Service due to human interference by habitat destruction via development, degraded waterways from urban and agricultural encroachment, the use of pesticides, hunting and poaching. Even though Little John and Emmett won the lottery when they landed in Gilmour’s hands, they sometimes get depressed. “They sulk in a corner when they don’t go to the beach. 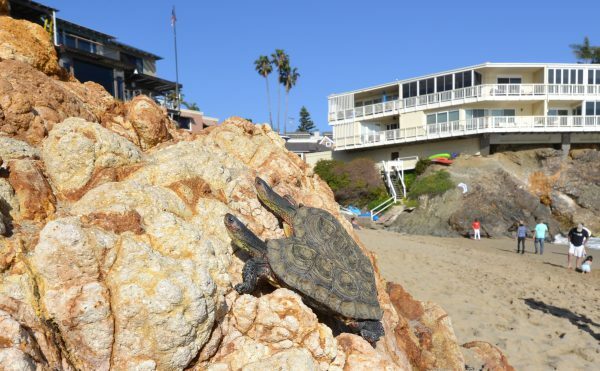 They like meeting people,” said Gilmour, who also takes them to swim at Pirate’s Cove at the south end of the harbor in Newport Beach. But when Gilmour amps up the speakers at home, especially if it’s a woman singing opera, Little John races to the middle of the room for a surround-sound experience. John Gilmour’s Honduras Wood turtles enjoy some rock climbing during a recent outing to Fisherman’s Cove. Photo by Harry Huggins. Enjoyed reading this story…what a revelation to think that turtles can be trained… much less to the extent of that training…very comforting! Wonderful story JG. Let’s connect in Mammoth! What a hero John Gilmour is! I loved that story! we are so blessed to live among.